Medinatona was a multi-organization event that was held for the Syrian refugees in Obour, one of Cairo satellite cities in May 2014. This event was designed within the framework of Mini Medina bringing together different project to facilitate the different processes of the children city. The Mini City lasted for five days. Despite the diversity of the participants, the age/social background differences, the children engaged in the mini Medina dynamics straight away, forming organically the hospital and the police station. There were attempts to build the guest house/hotel and the bank suggested by some of the children previously during the brainstorming session the day before. During on the brainstorming session, different groups drew the things and places they would like to have in their city. After the display of each group’s work, drawn on big piece of paper (approx. A2 size) , a vote was taken on which things should be built in the city. Collectively the children built the garden, hospital and police station were made. 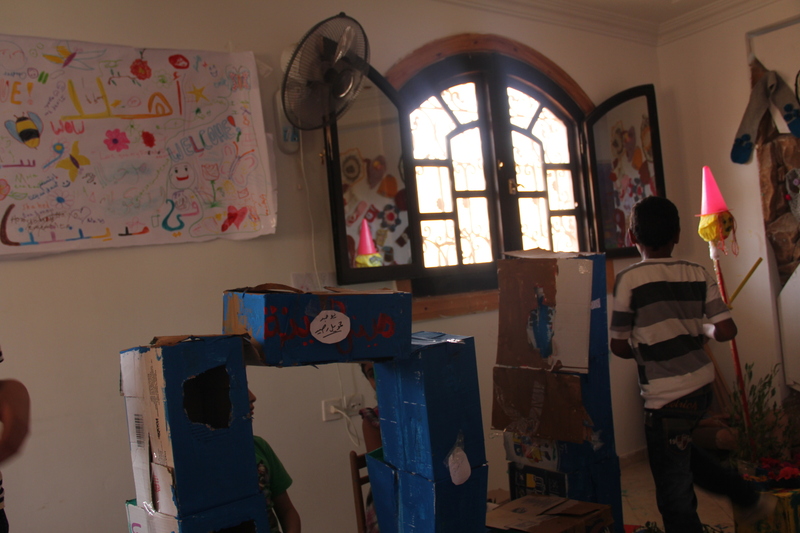 On the morning of the fourth day some kids (Aisha, Mahmoud, Mohamed and Yehia) decided to build the police station. Karim, the facilitator working with me, sat them down to plan what the police should do. They decided that the police station should be big, and it shouldn’t have a jail. They further decided that their role would be to patrol the city and monitor the other children that were not behaving properly. The punishment for any child misbehaving would be to take their citizenship points, and after three points have been taken, the police would take the misbehaving kid to the police station and hold him inside for twenty minutes before being allowed to interact in the city again. By the end of the morning they had built the entire police station and made police customs and tags. Their sole intervention happened when a kid came in and stormed into the police station raking the walls the “police” children had made. The “police” children arrested him in a peaceful manner and took away his citizenship points. During lunch the children were left to eat by themselves, and as soon as they finished the “police” children decided to arrest another child who was misbehaving, however this time the adults were not present. Here were are to note a difference between the formal face of the child that is shown to adults and the free face of a child when interacting with other children. This is to say that children from an early age develop an ability to expose a different type of behaviour depending on the subject interacting with them. In this specific case of the police arrest, the children adopted a peaceful understanding of the role of the police while they were interacting with adults, or rather when adults were observing. However, when the adults left, the children dropped their formal character and engaged with their free character. Both characters are present in all children, and they form part of the basic of pretend behaviour. However the free character is not formal, is not academic, is not formulated, it is unconscious pretend. By unconscious I mean that it is based on imitation of past experiences without questioning or analysing them. In the case of the police, when the adults left, the children arrested the misbehaving child by pushing him to the wall, making him stand against the wall with the arms and leads spread. Once they did this, they “police” children started to hit the child on the wall. As this event was happening a facilitator of another section of the Mini City came into the lunch room and stop the whole event. He said it was not tolerable to hit any children under the role play, and told them that the police station was closed and there would be no more “police” children in the Mini City. Following this he removed the police tag from all of the “police” children. The children became upset and came to tell me and Karim (facilitator) the whole story. They began by saying that it was very unfair what Hassanin (the facilitator that banned the police) had done to them. They expressed that he had no right to ban the police as it was their own game. They also said they were not going to hit each other anymore. As the kids calmed down we asked to make a circle so we could talk about what happened. We went back to asking the same question as in the morning ‘what does the police do?’, however this time the answer came form the free character perspective rather than the formal character. Mohamed, an Egyptian kid who is 14 years old, began the discussion by saying the police needed to torture people, arrest them, hit them. These description of the function of the police, although not very rational, is an imitation of what these children had seen the police do through their life experiences. Some of these children have seen this behaviour only in the TV, others have seen it on the streets and lived it through their personal experiences. After all children had spoken, Karim asked ‘but how do we want the police of the children city to be like?’ little by little they began expressing that their police should not be violent, that they should not have weapons, that the police should not torture, that the police should be there to help the people, that the police should protect the people, and that children that misbehave should not go to jail but to school. The children wrote these articles down, and decided to continue the play. After some point two children starting cleaning the floor, the children had been painting for three days with acrylic paint and the floor was full of colours. As the two started cleaning, more children started joining. Aisha, one of the girls from the police, started helping the children cleaning as to her, the police should be helping people in whatever activity they are doing. The other children in the police said they were not helping because they were boys. After a time watching the other children having fun with the water and the soap, they decided that it didn’t matter that they were boys the police was there to help the citizens of the city, and they also had the right to have fun with the soap.